Want to quickly see how the open-source software 1024 CMS works? You'll find a free and updated demo installation of 1024 CMS here. We are currently updating the 1024 CMS demo. Please check back shortly. There will be a new version up soon. 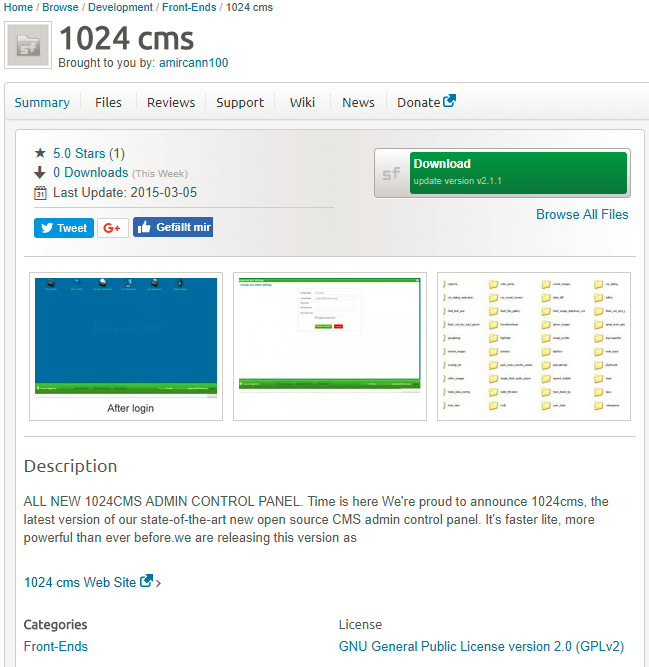 1024 CMS is a content management system developed using PHP and MySQL that stood out from the crowd as one of the few pioneers to implement AJAX technology into all its areas. It was first released in 2011 and focused on providing dynamic administration and user interaction, offering all users the ability to create their own interactive website in just a few easy steps, whether they were beginner Internet users or not. It’s a free open source CMS that requires a MySQL database and Apache web server in order to run. In terms of features, 1024 CMS offers the ability to create new pages and upload content like news articles or blog posts. You can also create your own community and download area, all of which can be easily managed using the admin area. You can also manage users and offer them a way to interact with each other using the powerful forum integrated within the 1024 CMS. In terms of security, it offered granular privileges, login history and session management. While its developer community focused on improving the 1024 CMS and expanding its features, other third party developers created themes and plugins that would enhance the user experience. The latest stable version released was 2.1.1 which featured a new, more powerful admin control panel dedicated to developers, numerous bug fixes and security problems updates. If you’re interested in getting a review of 1024 CMS you can download it and follow the installation process. The screenshot below gives you a preview of how an admin demo looks like before and after you login and what is the folder structure. You can set up your own 1024 CMS online demo and choose from different themes. This content management system is released under GNU General Public License version 2.0 (GPLv2) and has last been updated in 2015.